The Panda is the Chinese version of a 1oz gold bullion coin which many countries issue to allow individuals to buy bullion more easily. It was first made available in 1982. 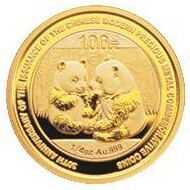 Unlike many other bullion coins, the design changes on every year of issue, though it always features one or more Pandas. These coins are legal tender in China and carry a currency value. Of course, the actual value of the coin is much higher than the currency value it shows. As with most bullion gold coin issues, sizes available include one-twentieth of an ounce, one-tenth of an ounce, quarter ounce, half ounce and one ounce coins. The coins are 0.999 gold, and the 1oz coin weighs 31.13 grams, or exactly 1 troy ounce. In addition to the standard coins, BU (Brilliant Uncirculated) versions are available. One of the main problems with this bullion coin is the belief that there are many fakes being sold to unsuspecting buyers. These coins look real to an untrained eye, but are not gold and are instead gold plated brass, and are lighter than the real thing. If you check the gold bullion forums, most of the queries from American and European buyers are of the form ‘Did I just buy a fake?’. Whether or not these rumors are true, there is a perception that there are many counterfeit coins being fed through into the market; for that reason, you may have trouble when you come to resell any Panda bullion coins in the future. Only buy from trusted vendors on sites such as Amazon. What are bullion gold coins? Bullion Gold Coins © 2019. All Rights Reserved.